I got into sailing at a young age when I spent the summers at a sailing camp in St. Michael’s, Maryland. My family had a motorboat that we would always take out as well. My parents taught my brother and me to swim before we could walk so being around the water has always been second nature. I love this question because most knowledge and skills on the water come from disastrous situations. I have had problems ranging from horrible weather (lightning and fog) to someone actually dying. I tend to embrace problems on a boat because you really don’t have another alternative. We all know ignoring problems does not solve them — and on a boat you usually don’t have time to waste when disaster strikes. I would tell them that “sailing” is actually pretty simple and obviously extremely enjoyable! But to add onto that, I tell people that to become truly confident in the world of sailing, you must do your homework. For example, study about engine troubleshooting, holding tanks, electrical systems, and docking. There is usually a lot more to “Sailing” than people initially think; but all of this knowledge is very much obtainable. People tend to get intimidated by the sailing culture and world, but it actually is very open-minded and everyone wants to learn and share knowledge. One of the mistakes I see people make is they start too large. I get it, you want to take to the high seas and sail around the world. The problem is that you have never been on a boat. In this case maybe you don’t buy the 50-foot Hylas as your first boat. I’m trying to say that people are a little too eager to get started and miss out on the opportunity to learn fundamentals about sailing that you cannot get on a large boat initially. I recommend sailing with a tiller for a while before moving to the wheel. I have worked with so many people over the years and studied experiences of others from the past and present. That’s like asking me to pick my favorite Beatles member, ha! Casey is one of our catamaran specialists as he teaches Catamaran skills in the Caribbean in the winter and with us in the summer. He also lives on his boat here at Cove Haven. 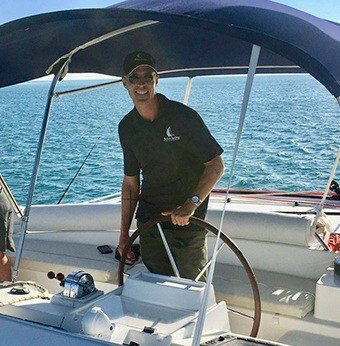 Casey also has extensive mono hull experience, and is very good with boat systems as he is an ABYC certified marine technician. Mostly Casey has a great demeanor and gets rave reviews from his students with his easy going style.